As a family we really enjoy caravanning and we think that caravanning should be enjoyed by the disabled as well as the able-bodied. The advantages of adapting standard models are? What kind of adaptations and modifications can be completed? One of the range of products is the Milford Person Lift, designed to lift a person, via a sling, from one seat to another, typically a wheelchair to car seat. The only drawback of the Milford is that it has a limited range of vertical lift, so we sometimes struggle with taller vehicles, e.g. Motorhomes. 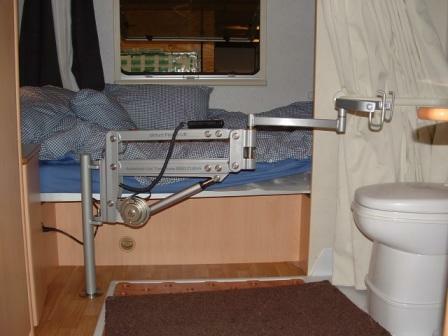 I have attached a photograph of an installation within a Motorhome which enabled the user to be lifted from their wheelchair to bed or toilet, with which they were delighted, but to lift them from wheelchair into the front passenger seat, we have to build special units which reduces the lifting capacity to around 10 stones. The Milford video can be viewed by following this link: www.youtube.com/autochair . The new product will lift a person either via a platform they can stand on, a seat they can sit on or a sling they can be lifted via. It will have an almost limitless range of lift and we hope that it will lend itself very well to the Motorhome market and possibly even caravans, although we may struggle to get sufficient strength within the caravan structure to mount the lift to. In order that we can develop the product range, we are trying to understand what challenges disabled or less mobile caravan/motorhome owners experience and what they would like the product to do for them? To help us to understand the potential market, we also need to try to determine how many such vehicles exist in both Europe and the USA and of those vehicles, what proportion of owners have these types of access issues. Obviously, the smaller the potential audience, the more expensive the products would be, but I suspect the number is quite considerable, hence developing the product! If you would like to comment or suggest how you would like this developed if you are disabled in any way, please contact www.autochair.co.uk or phone 01773 830222. The following is taken from the direct.gov website and gives information regarding what caravan sites, or any service provider, should be doing for the disabled. Any service provider who provides a service to the public in the UK, whether they charge for it or not, has duties under the Disability Discrimination Act (DDA). Service providers include holiday accommodation, tourist attractions, restaurants and transport providers. They cannot refuse to serve you as a disabled person or provide a lower standard of service because of your disability unless it can be justified. Service providers may need to make 'reasonable adjustments' to any barriers that may prevent a disabled person using or accessing their service. Under the DDA, service providers only need to make changes that are 'reasonable'. These might include simple changes to layout, improved signage and information and staff training which can improve accessibility to disabled customers. It's about what is practical to the service provider's individual situation and what resources they may have. They will not be required to make changes that are impractical or beyond their means. If you have any other information about disability holidays and caravans for the disabled which we have not mentioned, please let us know. 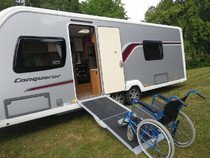 If you are disabled and would like to go caravanning, don't be put off - do a search on the internet for disability holidays - this will always bring back loads of websites to help you. 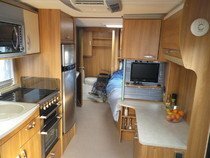 Your local caravan dealer will also be able to help you if you are thinking of buying a caravan and need some modifications. Don't give up - there is lots of help out there.